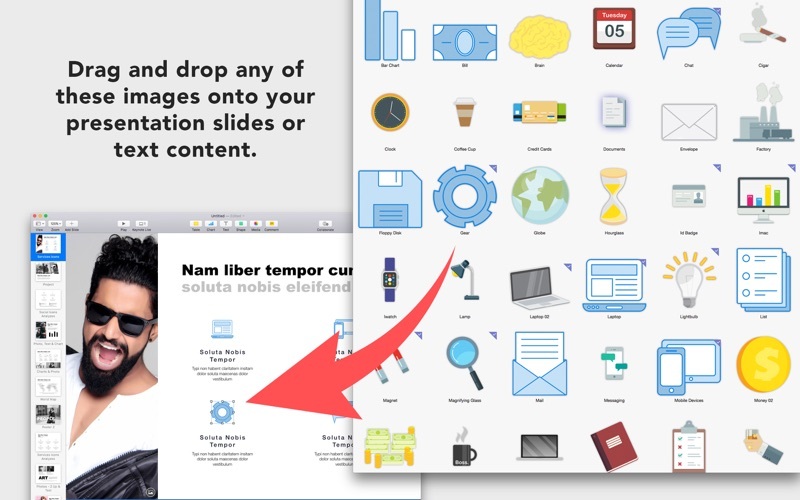 The ideal tool for users of iWork, GN Bundle for iWork- Templates for iWork provides you with over 3,100 unique designs for Pages documents, 400 spreadsheet templates for Numbers, over 150 first-class slideshow themes for Keynote, and over 2,000 images for illustrating your content. All templates are available in the US and international paper sizes. 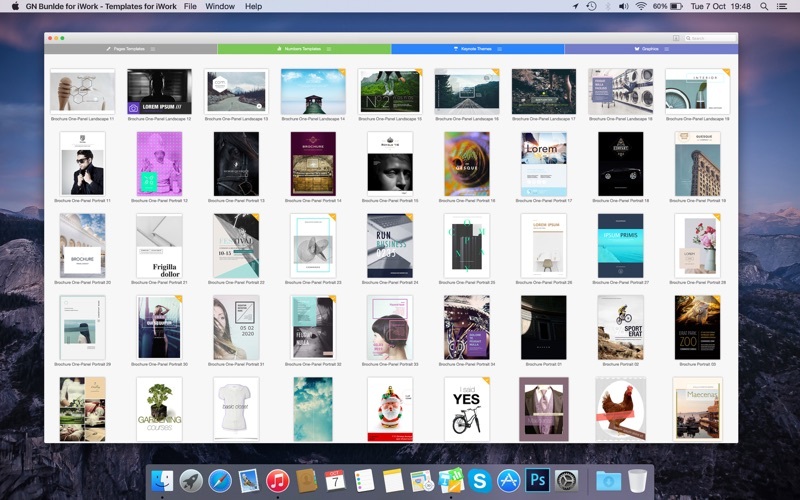 The premium-quality Pages Templates set offers over 3100 beautiful and functional templates for Apple’s Pages. It includes a variety of template types, from business cards and brochures to posters and invitations. 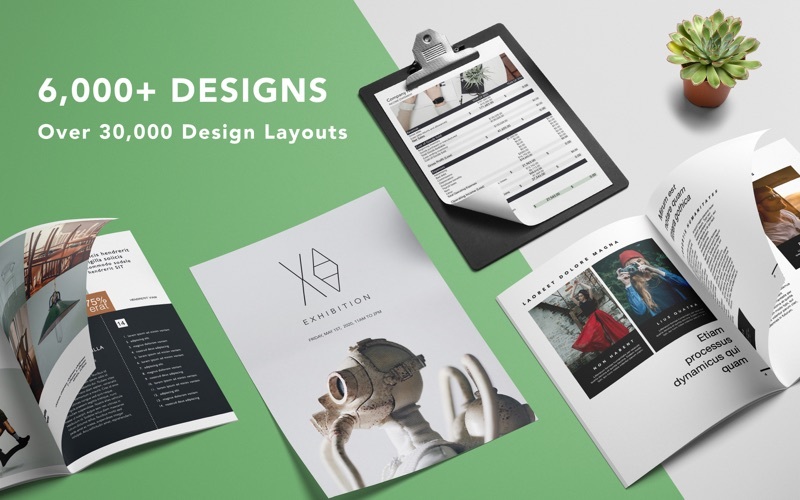 Pages Templates features a compelling combination of a modern and professional print layout and the gripping feel of creativity, adding a note of sophistication to your content. The high-quality Numbers Templates collection offers 400 diverse and useful templates for Apple`s Numbers. Use them for your business or personal needs. Handle your day-to-day tasks without difficulty. Customize the templates to your requirements: create tables, make calculations, draw diagrams, insert images thus tackling your job efficiently and effortlessly. 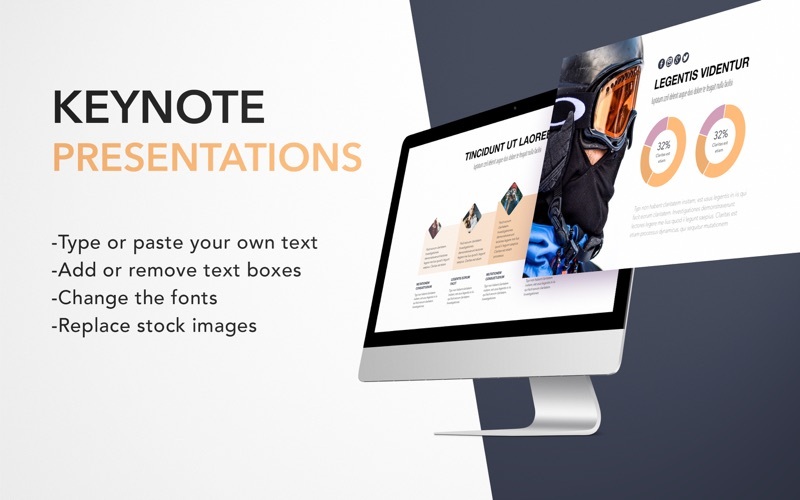 Keynote Templates consist of over 150 themes for Keynote presentations. 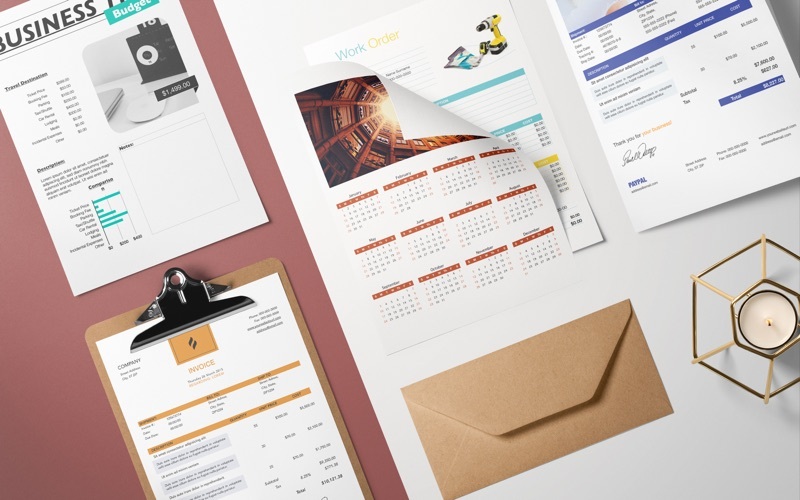 These are more than just pretty backgrounds – each one of them includes up to 24 different master slides, which lets you choose the best layout for your information. The themes are available in up to two sizes: standard 4:3 and widescreen 16:9. Let us take care of the appearance of your presentation, while you focus on the content. The Clipart category is a collection of 100 beautiful, detailed images, illustrations is an arresting collection of 324 images, ranging from lipsticks and watches to airplanes and factories–just drag and drop any of these images onto your presentation slides or text content, icons is a set of 329 slick, colorful icon images, including designs for electronics, medicine, transport, and the green movement. They will a touch of style to your website or infographic presentation, people Clipart contains 300 top-quality images, depicting people and their reactions in various work and leisure situations. They will help you put a friendly face on your slides, posters, Web pages, and other content. 784 photos contains high resolution photo images. Traffic Signs is a collection of 217 images of traffic signs used in the US and Europe. Speed limits, warnings, and bicycle lane marks – everything is covered. As other clipart products, traffic signs include transparent backgrounds, which allow placing the images on backgrounds of your choice. * Templates for Pages requires latest version of Pages; Templates for Numbers requires latest version of Numbers; Templates for Keynote requires latest version of Keynote.